A bow tie goes great with a cardigan, vest, or v-neck top layer. The Exhaust, like the Topographical Error and the Blueprint, is as much a piece of art as a garment. Dove gray ink on black depicts an engine as though it's been unfurled. Pretty neat. This bow tie is probably not an ideal stand-in for solid black at a conservative black tie event, but you already knew that. 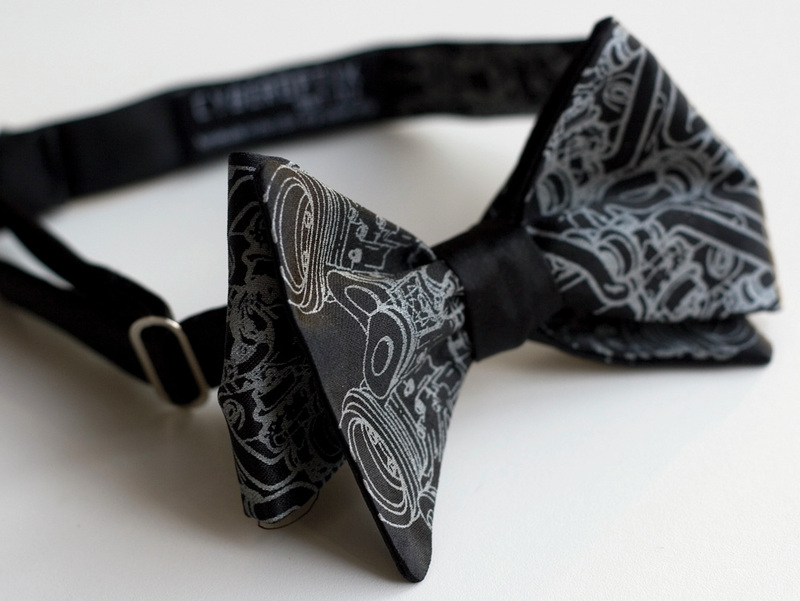 Instead, it's an unexpected, engaging alternative to a long tie or standard bow tie, recommended for bars, galleries, shows, museums, restaurants, and for any occasion where personality is a good thing (almost always). It's got a little extra functional kick too. A hook in the back lets you remove the tie without undoing your knot. So, next time you want to wear it, you can slip it on, hook it, and adjust as desired in no time at all.